A lot of wonderful people and volunteers come to Jeevraksha to feed the animals there with biscuits and other treats. The dogs look forward to this activity however we noticed two problems during the process and have found a solution for it. 1) Dog Fights: All dogs rush to the person who is giving treats and it was resulting in the stronger ones fighting and getting more treats and the smaller meeker ones being brushed away, and sometimes getting nothing at all. It also resulted in proper dogs fights and injuries at times. 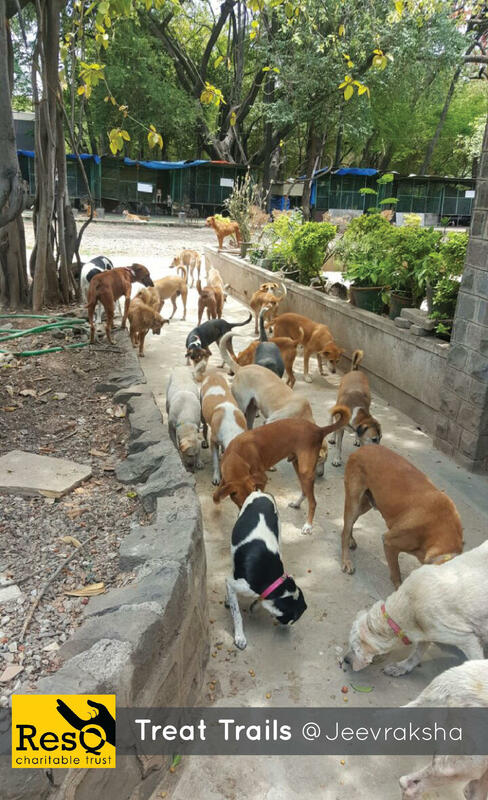 2) Selected Days Only: Most people find time to come and treat the dogs on weekends only and the dogs get barely any treats on the weekdays, and thus adding to the gluttony and fights on weekends! 1) Treat trails: Successfully for the last 2 days, we have determined a treat trail where we request the volunteer to walk along a path and to keep moving and dropping treats. There have been no dog fights because the dogs are busy looking for treats, there is enough right ahead of them to go for the next one, there is no competition and even the meeker ones are getting their fair share along the trail. Because the trail is a long path, every animal is getting some treats which didn't happen before when treats were only given in front where certain packs reside. 2) We are designating a locked space for treats for animals and volunteers will be allowed to go and access this space and have plentiful treats for the weekdays as well. Incase there are no volunteers on the weekdays, the RESQ staff will ensure the treats are given to the dogs at the treat timings. 3) We are determining treat timings which will be interspaced with the meal timings so the dogs do justice to their food meals and their treats! Win-win for all, we say!